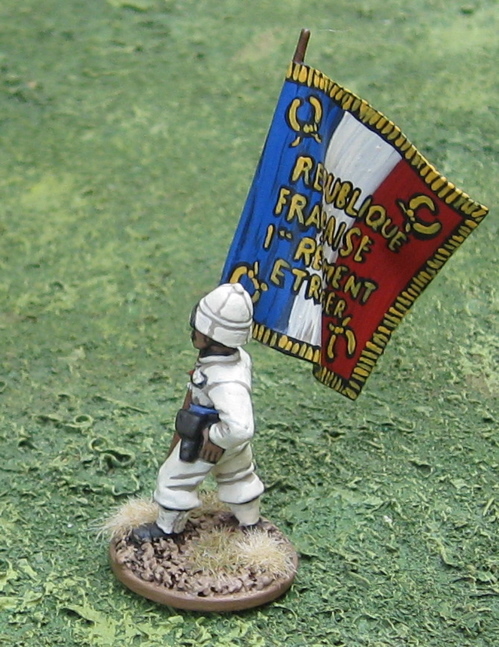 French Foreign Legionnaires from Artizan Designs. Only 13 of these are newly painted, two of them were painted previously... like a year (or so) ago! 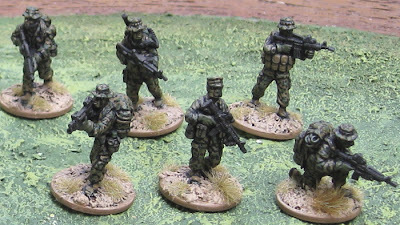 Actually, as I was just finishing these up and considering getting another unit of them out to paint, it occurred to me that I don’t actually have any HISTORICAL opponents for these!? I have to admit I think I picked them up thinking I’d use them in a semi-historical/fantastical African setting/ campaign involving competing adjacent colonies of France, England, and possibly Germany…? Or Belgium…? It was a loose idea I had a long while back – using a campaign system similar to the original Mighty Empires. Each European Power would have a small six hex colony/trading region/area of influence on the coast and could explore inland adding territory and resources, building trading posts and forts and mines and possibly laying train tracks… raising local troops or vying for regulars from the homeland and, ultimately clashing with the neighboring colonies… Anyway, the idea – like so many before (and since) – fizzled and I moved on to other things. 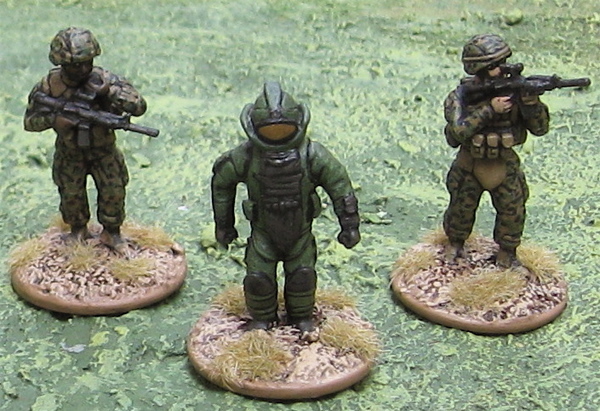 Or I might have been thinking I could use them on Mars in a Space:1889 sort of setting. So not really all that far off from what I may end up using them for in the near future (In Her Majesty’s Name - if it turns out to look interesting enough to set up a game). Since painting these and having a look at the stuff I’ve got I got to thinking I need to pick up a few more (Oh, not right now… like, maybe next year! But this is how it happens!). I have two units of guys in sun helmets, and two in kepis. Except one of the units of guys in sun helmets is short one… and I have about five spare chaps in kepis… Now I could just have a few guys in kepis join the units of guys in sunhelmets and leave it at that… but I got to thinking; if I ordered four more packs of guys in sun helmets (four packs of four would be 16 more) I would have THREE units of exactly 15 guys in Sun helmets! AND if I ordered three more packs of guys in kepis (which would be 12 more) I would have three units of guys in kepis plus only two left over – and if one of those three packs was a command pack I’d probably have a couple of spare officers I could use as higher command (a C-in-C and/or staff officer if I were using Ever Victorious Armies). Of course the mad (or maddest) thing about this plan is that, as I have mentioned, I don’t really have any genuine historical OPPONENTS!? Maybe more of these Legionnaires (I have two more units of these…). 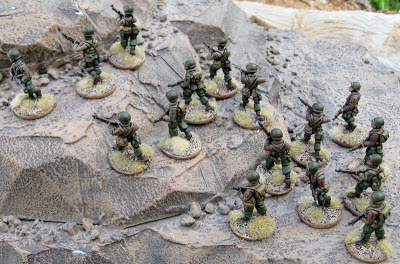 Or maybe some 1914 Belgians… or WW2 Soviets… or 1889 Maritans!? or a giant Movie Mummy… or… gosh, who knows!? I seem to be all over the place these days. Putting together a small force of the joint Canadian-American First Special Service Force (often referred to as the Devil's Brigade. 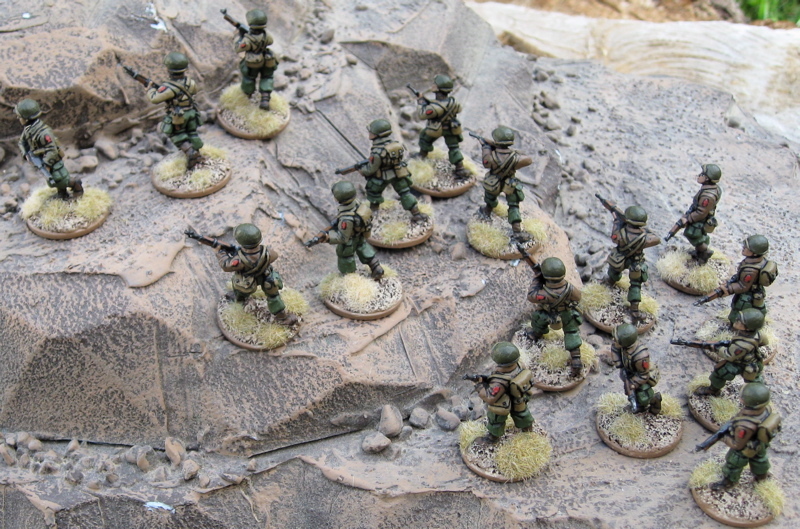 These are all from Artizan Designs Second World War - Devil’s Brigade line. 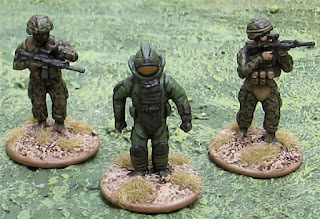 A couple weeks back North Star Miniatures announced on their Facebook page that new FSSF minis in parkas (including ones armed with the Johnson LMG) were now there – I took that to mean they had cast minis in stock, but depite checking Artizan’s website daily they have yet to appear… I’m guessing perhaps he meant the masters had arrived… and they are now being molded and cast. 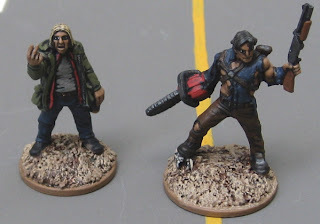 Anyway, I figured I couldn’t possibly justify buying more – even if it was to fill out a section or two that was missing vital components – if I didn’t have a few of them painted… so I painted all the ones I had! 1914 French or Belgians? I have no idea. 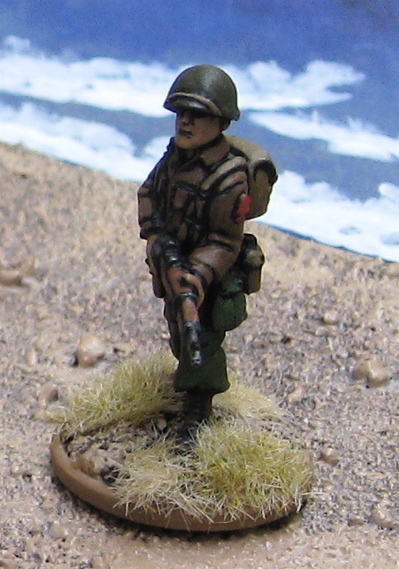 Assorted WW2 US Marines from The Assault Group. In the meantime I’ve been getting in a few board games with the kids. 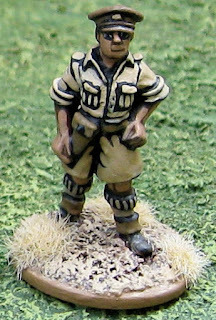 Support for the Generic African Militia. The whole Generic African Militia mob. Those aforementioned US Marines have lingered on the table long enough that I started putting some paint on a few. As minis come in I base and prime and often even do the “base goop” in batches so that minis are ready to paint when I feel the urge – also I can sotre them in the drawer/box they’ll be in along with their painted comrades and thus I have a sense of how much space I will need for them – and be remined any time I look at the drawer that I have some to finish up… Anyway, as the Marines arrived at the same time as these Africans I based and primed and gooped them all at the same time (along with some First Special Service Force troopers that arrived earlie but hadn’t been primed, etc. 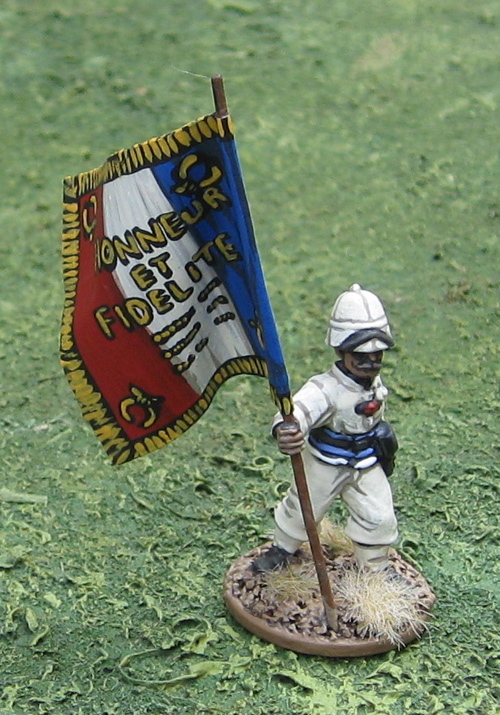 yet) and as they were still sitting there as I started painting the Africans… and sort of got some paint on them in the process… I may finish up a few of those… just for fun… along with some of those FSSF troops…? All these are form The Assault Group. Newly arrived additional support for my African Regulars – most often fielded as the Federal Army of the Republic of Timbogo. Ready to crush the insurgency by the People’s Revolutionary Army of Timbogo! So many other things to finish up… I don’t know where to begin. Do or Die! Gung-ho! Gung-ho! 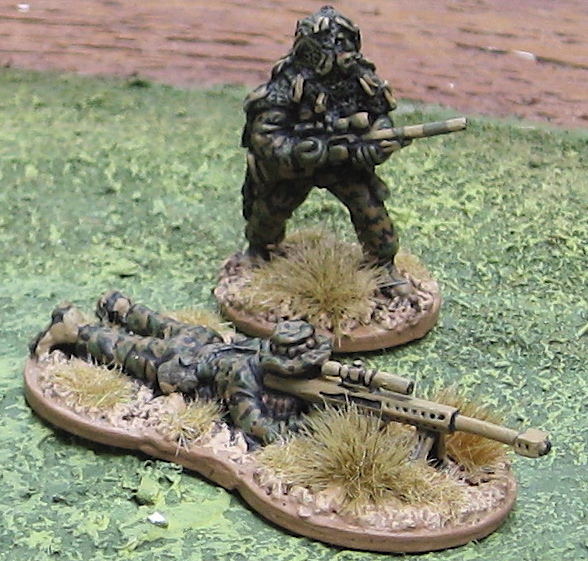 As mentioned I do have a could of plastic 1/48 scale plastic M1 tank models to assemble and paint for these guys… and would like to pick up two AAVP-7A1 and 3-4 HMMWVs (for a recce patrol) and maybe a LAV-25. I’ll probably finish up the Africans and Zombies first, then get cracking on The Mummy! 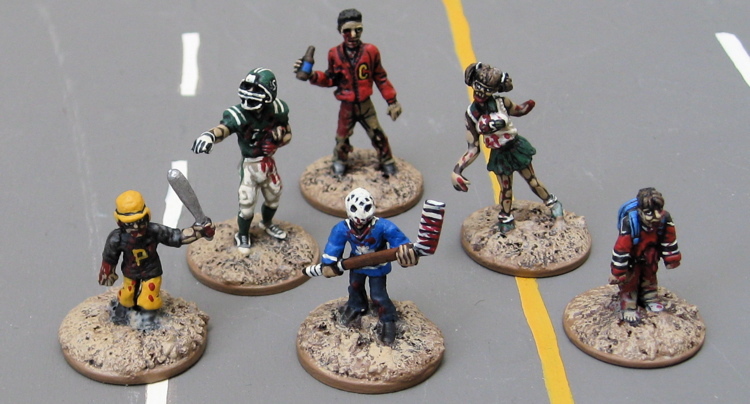 Assorted zombies from Cold War Miniatures, RAFM, and Mega Miniatures. 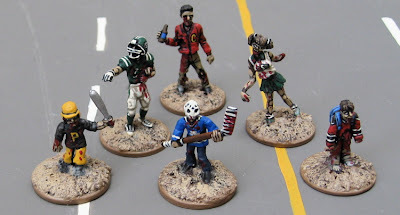 The cheerleader originally had a pompom – but it broke off in the process of painting her… and her arm was just so spindly I couldn’t pin it pack on so I slathered on some more blood and said she has no hand! I think there’s only nine or ten zombies left to do. I think it’s about time I took stock of things. I have only a few modern things left to paint. There’s some Americans, Generic US-backed South/Central Americans, Modern British SAS in temperate DPM, and a handful of Africans. 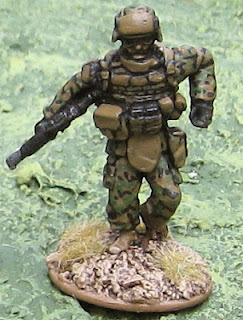 I suppose if we want to consider everything post-ww2 “modern”, then there’s also a few Vietnam minis; ANZACs and Americans. There’s also the Killer B Games Geezers, Shut It! 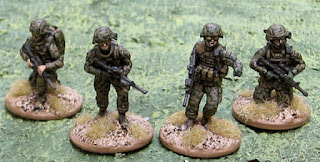 minis… and a bunch of vehicles to do… 2x M1, 2x Leopard 2, 3x Marders, 3x T-72, and a bunch of trucks and cars… a few helicopters and an airplane… And there are a few other things I’d like to pick up… (a few more Cold War Commies, 2x AAVP-7A1, Scimitar, BMDs, Humers…. And maybe a few other vehicles…). I guess that’s still quite a bit really, but for me it seems like the end is in sight. After that…? I thought I might work on finishing up some of my WW2 forces… and I might… but I’m also feeling like it’s time to get back to working on my Great War armies and playing some of that. I’ve also been feeling the urge to finish up some Greek Armies for HOTT or DBA. I think I have enough for five or six armies – which would make for a pretty fun campaign.